I help coaches, course creators and service providers grow visibility & attract dream clients using Pinterest. I love spending my weekends baking bread to go with my cheese (and wine!) and hiking in a forest somewhere. And on the weekdays, you’ll find me helping entrepreneurs grow visibility, list and business using Pinterest. In my 15 years of marketing experience - from large corporations to small businesses, I’ve gathered a few tricks up my sleeve. I know what it takes to attract the right audience, get the word out about your business, and turn browsers into buyers. I went from almost no website traffic to more than 17,000 sessions within a month of taking the course. I now have over 1,500 email subscribers, and am gaining more every day. Any time I purchase a new course, I worry "will it be worth the money?" I can confirm that Fab Pin Formula definitely is. Fab Pin Formula has allowed me to grow my Pinterest audience using the knowledge gained from this comprehensive course. With an active Facebook Group and Isabelle providing inspiration and feedback, means you have the support and answers to any questions from the material within the course. Fab Pin Formula is THE course to help you grow your Pinterest audience. 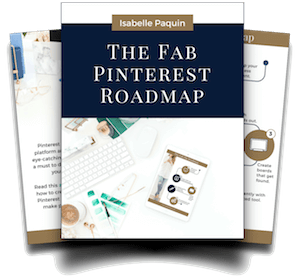 Isabelle clearly explains how to set up and use Pinterest to reach your target audience and drive traffic to your website. She is on-hand via the private Facebook group to answer any questions, and provides updates about Pinterest changes. Thanks Isabelle! Fab Pin Formula is not just a program, it is a journey; and it has been the best thing that has happened to me in my business, and one of the best things in my personal life. For me, the first very important benefit has been CLARITY. Before Fab Pin Formula, I had many interesting products which were so broad and didn't show any coherences. Through Isabelle’s help and guidance, I could clearly see what I was lacking. And, as a result, I went through a complete makeover and narrowed down my niche. Another wonderful thing regarding this program is the support group. You could feel two very distinct feelings at the same time: “INDEPENDENCE” and “BELONGINGNESS”. You are definitely responsible for improving your business and taking actions; AND you belong to a group of like-minded and supportive people. You could share absolutely everything in the group, there is no judgment. The only thing you will find in the group is support and friendly suggestions. We are all there for one another.